Do you enjoy reading memoirs? Think of the last memoir which you read. It may have been recent or long ago, but what stood out about it? The memoir may have revealed a portion of the author’s life. They may have gone on an extraordinary adventure or experienced a traumatic event (and came out on the other side of it). Why do we enjoy reading memoirs? I personally enjoy these because it enlightens me to the life experiences of others. You may not have the aptitude or desire to climb Mount Everest, but reading about it puts you on the mountain’s summit too. You may not have the expense of globetrotting around the world, but the author’s memoir makes you feel like their travel companion. Memoirs allow us to experience life in a whole new way. While most of us enjoy just reading memoirs, a portion of us want to sit down and pen our own life story. Before you do that, however, understand that there are misconceptions to it. Here are a handful to look out as you think about your experiences and the content of your book. Myth #1: Writing a memoir will help me recover from physical, psychological or emotional pain. Quite honestly, I am a huge fan of writing out negative feelings. I have done this ever since I was a kid. I am not a stranger to depression or life struggles. As a child, I wore a brace on my leg which caused me to be bullied frequently. Then, I battled spurts of depression in high school and college. The depression returned shortly after my car accident in 2012 after I had to learn how to use my hands and my right foot all over again. It was a traumatic process getting past the accident but a strong and encouraging support system helped me recover from it. There may be events in your own life which create road blocks for you. Start by sitting down at your computer and writing these out. Don’t expect the words to come easy. Likewise, don’t be hard on yourself if this is the case. Trauma and pain are hurdles we have to jump over. But, sometimes it’s hard (and long) process. If you find that you are blocked from writing, it may be too soon. The event may be too fresh. It’s possible that you’re not ready to approach the deep emotions which you encountered as a result of experiencing it. And you know what — that’s okay. Some day down the road (a month, six months or a year, ten years…) you’re going to sit down and these words are going to flow. Writing a memoir will not always heal your pain, but it can be a great first step at looking at it in an objective way. Myth #2: We have monopoly over our past — and everyone in it. We all have a host of fantastic (and not-so-fantastic) childhood memories. With those memories always come people. Be careful writing about people, especially if they don’t know you are writing your book. Hear me out on this. First and foremost, everyone has a different perspective. Your first boyfriend may have a completely different perspective of your first date. Interview him for your book if you want to be a hundred percent accurate. Each claim you make in your book should have proof or evidence to support it. Realistically, I would go as far as changing the person’s name for their protection. This puts doubt in the reader’s mind that you’re writing about a real-life person. Do you own your memories? Absolutely. On the contrary, freedom of speech is not absolute. Defamation, slander and libel are all not covered under the first amendment. Defamation are false statements which damage a person’s reputation. Be cautious of libel (written defamation) and slander (oral defamation) because they could easily turn into a court case. These may be regulated by different statutes within each state throughout the United States. While anecdotes and personalization are important in memoirs, it may be best to stick to the truth and only the truth. Don’t blur the lines and tell half-truths about anyone involved. This is how most defamation cases arise. While the memoir is about a portion of your own life, it may be interesting to include the perspective of another person involved in the situation. Readers are going to enjoy this in-depth writing because they’re getting all sides of the story. It makes your story well-rounded; and, it makes you (the author) more credible. Myth #3: Memoirs cover your entire life. This is a complete misconception. Most memoirs I have read only cover a portion of the writer’s life. Anything else would be fluff and dull to the reader. We don’t want to read a play-by-play of every second. Choose the highlights and put them in your book. Have a brainstorm session if you don’t know the focus of your book. What has been the high points of your life? Write a list of 5 events. Now, explain more in-depth how you got there. Maybe you’re a star athlete who’s been skiing since you were five years old. Even those that don’t enjoy sports would enjoy your book. It focuses on your career and the process of achieving your life dream. Focus on your message. What can people learn from your book? Why would they care about what you write? Hook them with an anecdote of your passion and you’re going to keep them until the last page. 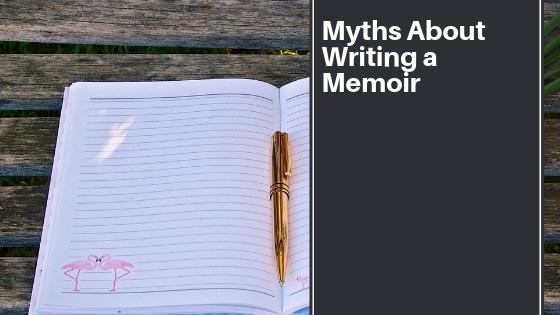 Myth 4: You’re writing a memoir only for family. Are you? Think about your target audience. Brainstorm who would be holding your book in a bookstore. This goes back to focusing on your book’s message. You have a wonderful story to tell readers. You have a powerful voice. Writing for family is a fantastic goal — but don’t clip your wings. You are so much more than a hobby writer. Your memoir has the ability to climb the best seller’s list if that is your goal. Make that your goal and you’re sure to achieve it. You have the capability of writing an awesome memoir. Don’t let these misconceptions stand in your way. Get back to writing!